Custom SG with oversized body has it been done? Discussion in 'Luthier's Corner' started by Maiden88, Feb 12, 2019. Any one have any pics or direction they can point me in the right direction? you can't sell, once you realize that it's a big mistake. Hang it on the wall, I suppose... and call it art. People pay a lot for wall hangings. guitar, and then play the hell out of it. Gibson designers know their craft. As do Fender designers and other successful instrument makers. someone else, because of how cool the ES design also is. instrument, not one that's already one of the best. There were lots of interesting and creative ideas that failed to flower then. Maybe you could give one of them new life, in an oversize form. This is a bass . Layne Matz, koaguilds, PermissionToLand and 1 other person like this. Plus 25% in size how? Total area of the slab, or length? Is it for a better visual balance with the player? Consider the added weight, you might want a weight-relieved body. Sg’s aren’t heavy to begin with. Weight isn’t going to be a problem. There are PLENTY of “boutique” makers doing almost exactly what you’re asking about. Making their own version of an sg, slightly different body outline but a bit larger. It should be extremely easy to scale up a photo etc. the only real issue to deal with will be the neck pocket etc. You’ll need to locate your bridge posts with your own measurements or by using the “intonation method”. Well, but scaling up the body, will it be a uniform resizing? I'm wondering whether the larger body would require some rethinking of the back, say a deeper ribcage chamfer? Also the neck joint, does the resizing affect playability in any negative way? Will the body thickness stay the same or will it be proportionally increased? Interesting project, will be following. Its not going to be a Gibson Custom ,I wish I could afford a Gibson Custom but I’m having it built by a great luthier. Yes I’m doing a Sg just bigger what was the biggest shaped body of the Gibson SG series? Does anyone know the largest model Gibson Sg body released in bulk that was not a bass body or baritone? When I read the thread-title, I thought, "man, an SG is the perfect guitar for my frame." Seeing as how the OP wants a bass and not a guitar, I can see why he'd explore this option, though. It would improve the balance -- which is sketchy on a six-string, some are neck-heavy, some ain't -- and a bass with its longer neck would sure ferfuckle that balance. So yeah, a little more surface area, a little deeper slab, and active electronics should help maintain balance on the instrument. Probably help appearances, too -- SG bass bodies always looked tiny to me, with that massive neck strung onto it. SG bass bodies always looked tiny to me, with that massive neck strung onto it. Kind of like a cricket bat attached to a dinner plate. Seeing as how the OP wants a bass and not a guitar, I can see why he'd explore this option, though. It would improve the balance -- which is sketchy on a six-string, some are neck-heavy, some ain't -- and a bass with its longer neck would sure ferfuckle that balance. I'm not so sure - a bass with a 24.75 scale length? I think he's after a 6-string with a body bigger than an SG bass. Either way, it'll improve the balance. Isn't the body of an sg bass the same size as the guitar? I thought they were and just had a longer neck and different bridge placement. Well, no matter the body size, a 24.75"-scaled bass isn't going to work. Between the flub issues and the intonation issues, such a thing would essentially be firewood. I think you're all misinterpreting him; he said bigger than the size of the SG bass, he never said it IS a bass. The SG body has never changed size, with the one exception of the SG-62, which was slightly smaller. But if your luthier is good, he should be able to scale up the SG body template to different sizes for you to decide what you want. I would start with the bass body, assuming it is larger as I believe, and go from there. I think you'd be surprised how much difference a small increase makes. I believe the bass body is bigger so that it still looks proportional with the longer neck. 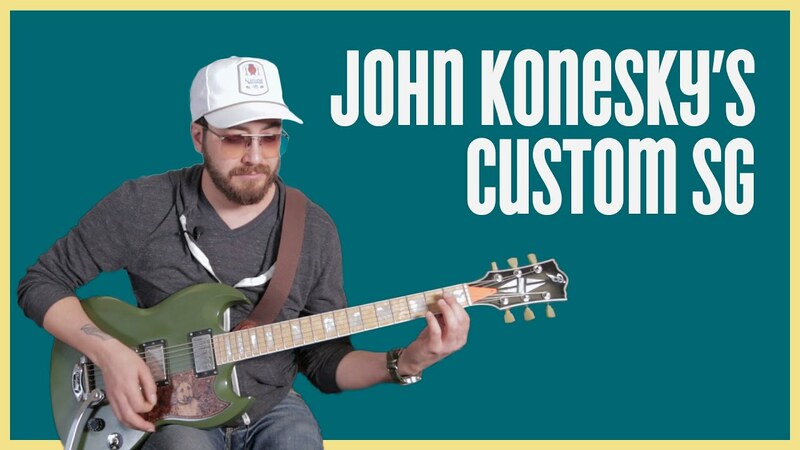 John Konesky (guitarist for Tenacious D) has a custom made SG. Not sure if it is scaled up proportionately, but it is much thicker (LP thick). Marty Music did an interview with him. It is pretty cool. I believe SGs made from around 1972 to 198X had those slightly wider bodies ..? I've heard it said that the body shape was changed with that model, so I compared a '61 Standard to a '72 Deluxe in photoshop. The only real difference appears to be the curve in the cutaways (the deeper cutaway is the '72). I suppose that's because the deeper set neck required less meat around the joint. I also compared other SGs from 1969 (same as '61), 1976 (same as '72) and 1984 (same as '72). So, as it turns out, the only SG to ever actually change the body shape in any significant way was the SG-62. I suppose the changes in beveling really do a lot to change how your eye perceives the shape. I was fully expecting the Norlins to have a wider waist and longer top horn, because they always looked that way to me. Satellitedog and Ray like this.